What’s Mindfulness Got to Do With Life/Career Coaching? Whether people come to see me for life coaching if they want to change or improve an aspect of themselves, or reach a personal goal such as run a marathon or write a book, or if they see me for career coaching because they want to find a different career path, I do one thing consistently with all my clients: I incorporate mindfulness (awareness of the present moment) into the work we do together. Why? Great question. Here’s why. It decreases stress. When we are constantly running around from one thing to the next, we tend to get overwhelmed, which causes a rise in the stress hormones in the body. Over time, this can lead to physical problems, such as high blood pressure, decreased immune functioning, and physical illnesses (including cancers), as well as to emotional disorders such as depression and anxiety. When people are in a job they don’t love or they are feeling like they haven’t reached a goal they would like to attain, they often experience chronic stress. Teaching some simple mindfulness techniques makes it easier to relax, which causes positive changes in many areas from work to parenting to relationships. It also improves the quality of your sleep at night, which is the foundation of everything else you do. Improving your sleep is the quickest way to cause positive changes in the rest of your life. It makes your brain work better. Studies have shown that meditation causes improvement in brain cognition, included increased mental focus. Also, when you are in the present moment and clear-headed, you tend to make better decisions. When you are stressed, you tend to breathe more rapidly and shallowly, which means less oxygen is going to your brain because it’s going to your extremities to prepare for the fight-or-flight response. This is great if a bear is chasing you, but otherwise, it’s not helping you decide what’s best for you. A few simple breathing exercises help you to draw in more air, oxygenate more of your brain, and think more clearly. It can cause physical changes as well. There’s definitely something to the mind over matter idea. One study found that hospital patients who had a view of nature healed faster from surgery and required less pain medication than other patients. 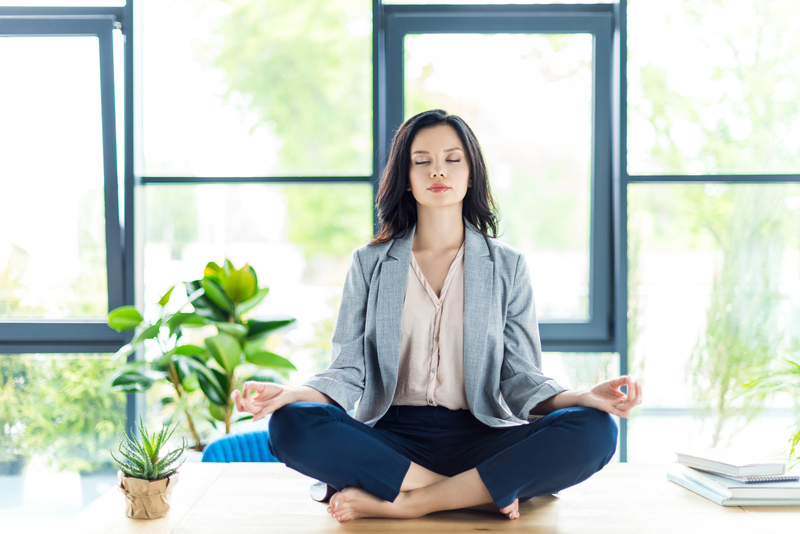 Being relaxed allows your body’s natural healing abilities to take over, which is why more and more research is being done on the impact of mindfulness on illnesses. Another mind-blowing study showed how a guided meditation caused measurable physical changes in the body simply by thinking about working out. This type of research is guiding some professional sports teams in their use of virtual reality to improve one’s game without the risk of injuries. This is one of the areas I find most exciting in the power of mindfulness techniques. It helps you identify “wants” versus “shoulds.” When you are in the present moment, it’s way easier to decide what you actually want, versus what you think others think you should do. It quiets the monkey chatter of self-doubt, fears, and second-guessing yourself. One of my clients was offered a substantial promotion in terms of pay and job title, but did not appear happy or excited about it. Upon exploration, she realized she did not want the promotion as she had no desire to manage other people, but felt she “should” do it, as others would view her as being more successful. Once she identified this, she turned the job down and felt a huge sense of relief. Anytime, the word “should” pops into your head around a decision, it means it’s time to use some mindfulness to dig a little deeper. It increases your intuition. The more clear-headed you are, the more you are fully able to access the information around you. When you are trying to think five steps ahead or are worrying, you are not able to allow that information to come to you easily. Instead, your constant thoughts of “what should I do?” are actually blocking the answer from coming to you. If you are quiet, you can tap into your subconscious and find that you had many of the answers all along. One of my clients who owns several multi-million dollar businesses told me that due to our mindfulness work, he can now tell almost instantly which clients he should take on and which he should turn down, based on his intuition. Billion-dollar U.S. hedge fund manager, Ray Dahlio, was asked how he has been so successful over the years, and he said the number one reason for him was daily meditation. Mindfulness impacts every single area of your life. All of the good things in your life happen in the present moment; not when you are worrying or stressed, so it makes sense to live in the present as much as possible. Need more mindfulness in your life? Try a free app, such as Calm or Insight Timer, and spend more time outside in nature. Want to dive deeper? My favorite meditations (the ones I do every night myself) are the ones through Brainsync where you can choose meditations for topics ranging from confidence to anxiety to prosperity (this is an affiliate link). Brainsync even has binaural meditations which induce deeper brainwaves and are amazing! Whatever you choose, take the first step toward mindfulness and notice the difference in how you feel. Many of my clients have said that mindfulness is hands down the most life-changing of the work they do in coaching. Kristi Helvig, Ph.D., C.P.C., is a licensed clinical psychologist and certified professional life and career coach who works with clients all over the world via Skype, or locally in her Denver office. Contact Dr. Kristi to set up a free coaching consultation at drhelvig (at) yahoo.com.